On May 22, 2014, the Office of Management and Budget solicited comments on a proposal for changes to the North American Industry Classification System (NAICS) that would take effect in a 2017 revision. The revision would reclassify factoryless goods producers (FGPs) such as Apple and Nike, most of which are now in wholesaling or management of companies, as manufacturers, and move trade by manufacturing service providers (MSPs), such as China’s Foxconn (which builds Apple products) into services. In What is manufacturing and where does it happen?, I show that this proposal would artificially inflate U.S. manufacturing production and employment and deflate U.S goods trade deficits with many countries. It would also irrevocably change U.S. balance of payments accounting. I recommend that OMB should withdraw its NAICS 2017 proposal regarding FGPs and MSPs, and remand the issue to the OMB committee that handles trade statistics policy for reconsideration. NAICS is used by the myriad federal statistical agencies that collect, analyze, and publish economic data, including data on trade. The OMB proposal was developed to respond to the rapid growth of establishments that design products but outsource most or all of the production process. The NAICS 2017 proposal—which is part of a broader, international, behind-the-scenes effort to redefine and recalculate U.S. and international trade accounts—would artificially inflate measures of U.S. manufacturing production and employment by arbitrarily moving wholesalers such as Apple and Nike into manufacturing, and changing substantial quantities of the goods we import into services. This would reduce our reported trade deficit in goods (on a balance of payments basis), with no change in our underlying balance of trade. And it would make it appear that U.S. manufacturing output has increased when, in fact, much of the actual manufacturing production has been offshored. Suppressing measured trade deficits through statistical manipulation is no substitute for better trade and manufacturing policies. Congress should order a comprehensive review and evaluation of recent and planned changes to U.S. international trade and national accounting statistics, and of the international standards on which U.S. trade accounting systems are based. Anyone who knows the shameful history of the U.S. response to Jewish refugees before World War II wants to avoid repeating it. As the Nazi genocide progressed, the United States turned its back on the Jews, infamously forcing the St. Louis, a ship with more than 900 German-Jewish refugee passengers, to sail back to Europe in June 1939 after it was refused entry to Cuba, rather than issuing visas to the refugees. President Franklin Roosevelt could have intervened through executive action, but chose not to in the face of the public’s anti-Semitism, worries about competition for scarce jobs, and isolationism. More than 250 of the St. Louis’s passengers eventually died in the Holocaust. At the same time, Congress refused to take steps to save Jewish children who were fleeing Nazi violence and persecution. Bills introduced in the House and Senate to admit 20,000 German-Jewish children beyond the existing quotas were allowed to die in committee. The United States had no role in the rise of the Nazis, but we are deeply involved in the political instability of Central America. We took sides in a civil war in El Salvador and supported a coup in Honduras. The United States bears a large part of the responsibility for the drug violence and armed conflict in Central America that are driving so many children from their home communities. We are the consumers of the drugs whose sale and transshipment enriches the drug gangs and fuels the drug wars. Without our insatiable consumption of illegal drugs, the drug violence would diminish. Moreover, as Jeff Faux has argued, without our militarization of the region and our billions of dollars of support for violent, right-wing governments and militias, large parts of the population would not live in terror. And finally, without our trade policies, which have disrupted the Central American economies and displaced tens of thousands of agricultural workers, there would be less of an economic incentive to immigrate to the United States. This morning, the Congressional Budget Office released its latest long-term budget outlook. While CBO projects the federal debt to begin increasing sharply in future decades, the main takeaway is that, with the debt stable for the remainder of this decade relative to the size of the economy, Congress should not see these projections as a reason to double down on economy-stunting austerity. Instead, policymakers should take advantage of our fiscal health to make the investments necessary to help boost our demand-starved economy and our still-flagging labor market. CBO expects annual deficits to range from 2.8 to 3.5 percent of GDP through 2020—down from a peak of 10 percent of the economy in 2009—and not to reach 4.5 percent again until 2027. Yes, says CBO, over the long run our debt is a problem, especially as health care costs truly escalate in coming decades. And yes, CBO assumes that certain tax and spending policies will lapse when they will in all likelihood be extended, meaning today’s projections of future deficits are too low. But while our recent political past is strewn with the carcasses of failed grand bargains, fiscal commissions, and super committees, this near-term picture shows us that our deficit hysteria has calmed for good reason—there is no near-term deficit problem. Let’s look at it this way. Since the Simpson-Bowles fiscal commission released its final proposal in December 2010, actual and projected budget deficits have fallen by $2.2 trillion over the 2011–2020 window, compared to the baseline the fiscal commission was working with—even with no bipartisan grand bargain over the budget. The U.S. steel industry won an important victory late Friday afternoon when the Department of Commerce announced that it would impose punitive tariffs on manufacturers in Korea and eight other nations who have dumped steel pipes in the United States at artificially low prices (producers from India and Turkey were also hit with countervailing duties to offset illegal subsidies). The background for this decision is explained in our May report on surging steel imports, which showed that the U.S. steel industry is facing its worst import crisis in more than a decade, with more than half a million U.S. jobs at risk. Commerce’s decision last week concerned imports of Oil Country Tubular Goods (OCTG), steel pipe that is used to build out the infrastructure needed to support the booming American oil and gas fracking industry. Imports of unfairly cheap and subsidized steel pipes have decimated domestic producers and threaten the jobs and incomes of thousands of steelworkers and their families. U.S. Steel had already announced the closure of two U.S. plants making OCTG pipe, and many more jobs and plants are at risk. Among the nine countries included in the OCTG case, Korea was by far the largest supplier of imported steel pipe sold at artificially low prices. In a closely related development, a Wall Street Journal story published last Thursday asked “Is Korean Steel Really Chinese?” This is an important issue in the larger steel crisis. Our May report showed that the major cause of the global steel crisis is the growth of excess global steel production capacity. Chinese producers account for more than a third of total excess global capacity, which now exceeds half a billion metric tons. Much of this capacity is targeted on the U.S. market, one of the largest and most open in the world. We added 288,000 jobs in June, bringing the second-quarter average growth rate to 272,000. 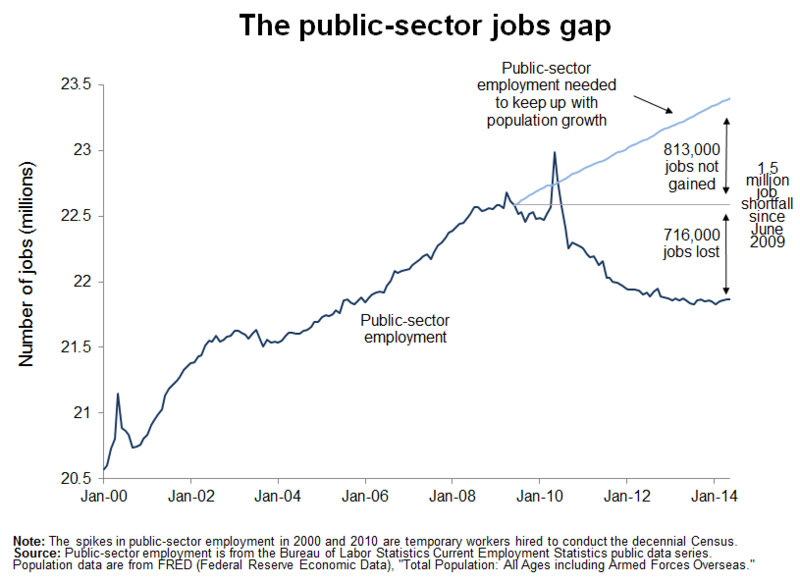 This is strong job growth. The only sobering part is that we still have a gap in the labor market of 6.7 million jobs, and even if we saw June’s rate of job growth every month from here on out, we still wouldn’t get back to health in the labor market for another two and a half years. The unemployment rate dropped from 6.3 percent to 6.1 percent, and it was mostly for good reasons! Recall that the unemployment rate can drop for good reasons—a higher share of potential workers find jobs—or bad reasons—potential workers drop out of, or never enter, the labor force because job opportunities are so weak. Most (though not all) of the improvement in the unemployment rate since its peak of 10 percent in the fall of 2009 has been for bad reasons. But in June, the drop in the unemployment rate was largely of the good kind. The labor force participation rate held steady, and the share of the age 16+ population with a job increased by one-tenth of a percent. Furthermore, the share of the “prime-age” population with a job (my favorite measure of labor market health), increased by three-tenths of a percent, restoring it to its March level following two months of declines. The issue of “missing workers”—potential workers who, because of weak job opportunities, are neither employed nor actively seeking a job—still looms large in today’s labor market. I estimate that there are roughly 6 million such workers, and if they were in the labor force looking for work, the unemployment rate would be 9.6 percent instead of 6.1 percent. Monday’s Supreme Court decision in Harris v Quinn was destructive in several ways. It undermines the unionization that has been transforming home health care from a rock-bottom, minimum wage job with no respect and no benefits into something much better. That, in turn, could worsen the care provided the disabled by lowering pay, making the profession less attractive, and worsening turnover. The nakedly political decision damages the constitution and the credibility of the Court. And the majority opinion foretells even greater damage for public employee unionization and collective bargaining when the Court revisits these issues again. Continuing its recent habit of allowing a foreseeable problem to become a full-blown crisis, Congress has so far done nothing to prevent the looming insolvency of the federal Highway Trust Fund (HTF). The HTF is a dedicated account from which the U.S. Treasury draws to pay for road construction (and provide support for mass transit). Because the gasoline tax—the HTF’s primary source of dedicated revenue—has not been increased since 1993, more has been spent from the HTF than it has taken in for years. Since 2008, Congress has needed to transfer $54 billion from the U.S. Treasury’s general fund to the trust fund to prevent its insolvency. Unless Congress again transfers general funds to the HTF, or otherwise closes its funding gap, the trust fund is expected to go bust this August. And if highway spending were to be reduced to the level of current revenues for one year, because the trust fund “has no authority to borrow additional funds,” it would cost our economy 160,000 to 320,000 jobs, using my colleague Josh Bivens’s methodology. I should note two things about this short history. First, there’s no particular economic problem facing the federal government here. HTF spending is already factored into the federal budget’s baseline. Continuing to finance its operations with general fund transfers will hence do nothing to increase overall projected federal budget deficits. Instead, this is largely an accounting problem—spending is constrained by the fact that, by law, HTF spending is supported primarily by a dedicated tax. Second, if policymakers nevertheless object to the fiscal non-problem of continuing to finance highway spending in part with general fund transfers, there’s obviously a simple solution. No, not a huge corporate tax break. Instead, we could just raise the federal gasoline tax. Earlier this week, EPI economist Heidi Shierholz spoke on a Congressional Full Employment Caucus panel about policy fixes to the nation’s long-term unemployment crisis, convened by Rep. Conyers (D-Mich.). Other panelists included Betsey Stevenson, Member of the White House Council of Economic Advisers, and Judy Conti, Federal Advocacy Coordinator at the National Employment Law Project. Below is an excerpt of her comments, which explain why we remain in a long-term unemployment crisis, why the long-term unemployed will continue to face tough job odds without substantial policy intervention, and what can be done to address it. The Great Recession officially ended five years ago this month, but the labor market has made only agonizingly slow progress towards full employment. We’ve had an unemployment rate of 6.3 percent or more for more than five and a half years; as a reminder, the highest the unemployment rate ever got in the early 2000s downturn was 6.3 percent, for one month. And even this headline unemployment rate probably overstates the true degree of labor market weakness, as it has fallen in large part in recent years because people have left the labor force in large numbers—and not just voluntary retirees. 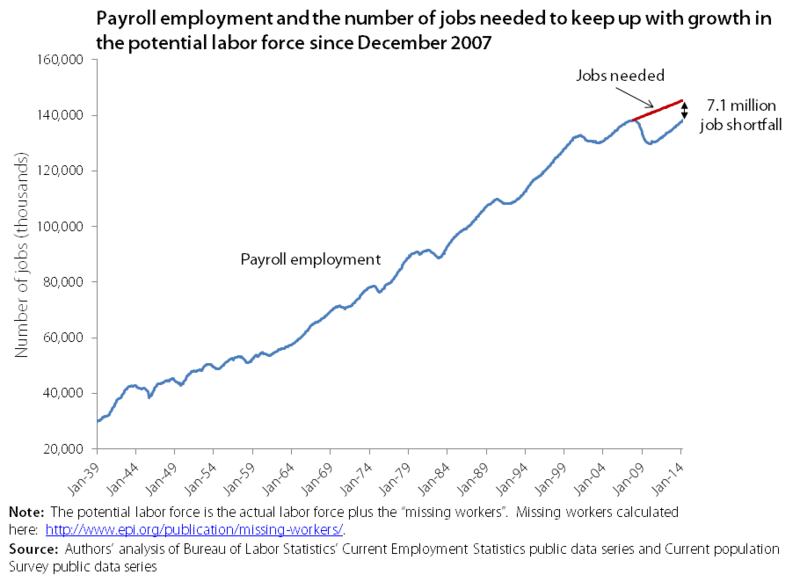 If the job market improves in coming years, it is very likely that many of these “missing workers” will return. Because of the ongoing weakness in the labor market, long-term unemployment remains extremely elevated. Though the labor market is headed in the right direction, unemployed workers still vastly outnumber job openings in every major industry, and the prospects for job seekers remain dim. The labor force is comprised of employed people and jobless people who are actively seeking work. Before the Great Recession started, just 0.7 percent of the labor force was unemployed long-term. That shot up to 4.4 percent by the spring of 2010, and has since dropped part-way back to 2.2 percent. This may not sound high on the face of it, but it is still three times higher than what it was before the recession began and represents 3.4 million long-term unemployed workers. Furthermore, outside of the Great Recession and its aftermath, it is higher than at any other time in more than 30 years, including the entirety of the two recessions prior to the Great Recession. Importantly, it is also far higher than any period in the past when Congress has decided to end extended unemployment benefits. In short, we remain in a long-term unemployment crisis, even if you wouldn’t know it judging from too many policymakers’ actions. It is important to note that there’s no real puzzle as to why long-term unemployment is high: economic growth remains extraordinarily weak. And this weakness is driven simply by an ongoing shortfall of aggregate demand (spending by households, businesses, and governments) relative to potential output. The Supreme Court is about to issue a decision on a case that could hit working people—especially working women—right in the paycheck. Harris v. Quinn is about isolating individual workers so they are weak and unable to protect themselves in a labor market that fails to reward their hard work. By weakening the unions that have organized home care workers, given them a voice, and helped them win wage and benefit increases that are lifting many of them out of poverty, Harris v. Quinn could block the road to economic opportunity for a largely female, economically disadvantaged workforce. Right-wing groups want the public to think Harris v. Quinn is as a case about freedom of speech and association; they pretend it is about protection of the individual—but how does it protect an individual if the end result is a smaller paycheck? American workers, by and large, have suffered from stagnant wages for decades. At the same time, the percent of working Americans in unions or covered by union contracts has been falling. Studies suggest that a substantial part of this wage stagnation is the result of eroded unionization, as fewer workers, both union and nonunion, benefit from the unions’ ability to improve wage standards in particular industries and occupations. The consequence: profits have reached historic highs, CEO pay is in the stratosphere, but workers are not sharing in the nation’s ever-increasing wealth. Almost anything that worsens these trends ought to be avoided, including anything that weakens unions or makes it harder for workers to bargain successfully. Americans need a raise: more pay for the work they do, better benefits, and more regular hours, and they need help in getting it. On their own, the ability of individual Walmart cashiers, for example, or Amazon’s warehouse workers to get a raise is negligible. But collectively, if they can join together and bargain as a group, they would have a chance to exert enough leverage to make the companies listen to their demands. The players in the NFL, MLB and NBA all know that what they have won had to be wrested from management. This month, a California judge struck down California’s teacher tenure law in a landmark case, Vergara v. California. Proponents claim that eliminating tenure will mean fewer ineffective teachers at low-performing schools. But teacher tenure in the K-12 context does not mean a lifetime guarantee of a job. It means that teachers have basic rights—most importantly, the right to due process if the district wants to fire them. This distinction is critical, both because eliminating tenure does not necessarily make it easier to fire bad teachers, and because tenure can actually help attract good teachers to hard-to-staff schools, retain them, and support their role as voices for student justice in those schools. New York University professor (and EPI board member) Pedro Noguera notes in the Wall Street Journal that both the plaintiffs’ suit and the judge’s verdict are fundamentally flawed. Noguera agrees that there are disparities in teacher qualifications and quality between schools serving high- versus low-income students, but tenure does not contribute to these differences. The fact is that schools serving low-income students have less funding and fewer resources than schools in more affluent areas. That means they aren’t able to pay teachers as much. It means class sizes are larger, nurses and counselors are fewer, libraries are worse. These and many other factors make it harder for low-income schools to attract and retain good teachers. The due-process protections afforded by tenure, at the very least, ensure that teachers who do stay in high-poverty schools can speak out against these inequities and be advocates for a more just system for their students. Today, Sen. Tom Harkin (D-IA) and eight co-sponsors introduced legislation to restore overtime protections for low- and mid-wage salaried workers. The Restoring Overtime Pay for Working Americans Act would guarantee overtime pay for millions of salaried workers earning less than $52,000 a year. Americans are working longer hours and are more productive than ever—yet wages are largely flat or falling. Indeed, the median worker saw a wage increase of just 5.0 percent between 1979 and 2012, despite overall productivity growth of 74.5 percent. One reason Americans’ paychecks are not keeping pace with their productivity is that millions of middle-class and even lower-middle-class workers are working overtime and not getting paid for it. This is because the federal wage and hour law is out of date—and especially the regulation that sets the salary level below which all employees must be paid time-and-a-half for their overtime hours. Updating overtime rules is one important step in giving Americans the raises they deserve. If the threshold is raised from its current $455 per week ($23,660 annually) to $984 per week ($51,168 per year, the threshold’s 1975 level, adjusted for inflation) millions of salaried workers would be guaranteed the right to overtime pay if they work more than 40 hours in a week. This bill would go above and beyond the recent announcement by President Obama in strengthening overtime pay regulations. I salute Sen. Harkin for taking up this issue and calling for a reasonable salary level, indexed for inflation, along the lines Jared Bernstein of the Center on Budget and Policy Priorities and I have advocated. Sen. Harkin led the battle in Congress in 2004 to block a set of very detrimental changes the Bush administration made to the overtime rules. While Sen. Harkin was not entirely successful, he did force the Bush Labor Department to issue a final rule that was less damaging than its first proposal. It’s heartening to see that both Sen. Harkin and his colleagues, along with the Obama administration, continue to believe that low and mid-level workers should be paid when they work overtime. If more workers were paid time-and-a-half when they worked overtime, it would boost the economy and show that in America, hard work pays off. In politics, bad ideas never go away, even after being shown to be bad. A repatriation tax holiday is a case in point. Senators of both parties have suggested using revenue generated from a repatriation holiday to plug near-term shortfalls in the Highway Trust Fund, which will be depleted within a couple of months. The problem, of course, is that revenues are only generated in the short-run, and revenue losses in out-years dominate the overall budget impact of a repatriation holiday. Under its baseline budget, the Congressional Budget Office projects a fiscal year 2015 Highway Trust Fund shortfall of about $12 billion. The Joint Tax Committee projects that a repatriation holiday enacted this year would bring in about $13 billion in additional revenue in fiscal year 2015. Sounds like a great fix for a budget problem. What is not mentioned is cumulative Highway Trust Fund shortfalls between 2016 and 2024 total $824 billion and that the repatriation holiday will reduce federal tax revenues by $115 billion over the same period. Consequently, using a repatriation holiday as a short-term fix would increase longer-term federal budget problems associated with underfunding the Highway Trust Fund—increasing projected deficits from $824 billion to almost $1 trillion over the next 10 years. Surely, a repatriation holiday is a bad and costly idea. But there are also other problems with a repatriation holiday, which requires a brief and, admittedly, wonkish review of the 2004 repatriation holiday. But this is only a problem if one assumes I was making a statement about the entire run of post-World War II U.S. economic history. I wasn’t. I was instead looking only at why the black-white unemployment gap grew in the past seven years. Importantly, focusing on these particular seven years is not an arbitrary or random selection—that’s the period of time since the previous business cycle peak, a span of time often looked at by researchers to assess labor market trends. That being said, I think Philip’s exercise is an interesting one and worth repeating, by comparing changes over similar periods of time in previous business cycles. Read the rest of this commentary in The Hill. That our children attend schools that are segregated by race is probably not a surprise for any of us. While, as researchers, we might debate how consequential segregation is, we can likely agree that, on its face, segregation raises some important societal concerns; it challenges our sense of what a moral and fair system looks like. It poses barriers to social cohesion, inclusion, and integration—and their well-known positive impacts on society—and it limits our children’s preparedness for the multicultural world in which they live. As we mark the 60th anniversary of the Supreme Court’s Brown vs. Board of Education decision, and the declaration that “separate but equal” is unconstitutional, we look back on both progress made in desegregating schools and, more recently, backtracking on those efforts and current initiatives that sideline them. Although separate but equal is unconstitutional, separate and unequal is very much a reality. In today’s weak labor market, there are around 6.0 million “missing workers”—potential workers who, because of weak job opportunities in the aftermath of the Great Recession, are neither employed nor actively seeking work. Some have suggested that many of these missing workers may be at or near retirement age and, in the face of weak job opportunities, have simply decided to retire earlier than they otherwise would have. While this would clearly indicate a huge waste of human potential and a serious indictment of macroeconomic policymakers that allowed economic weakness to linger on so long, it would also indicate that these workers are very unlikely to rejoin the labor force in coming years no matter how dramatically economic conditions improve. This would in turn mean that their absence is not in fact an indicator of current slack in the labor market. 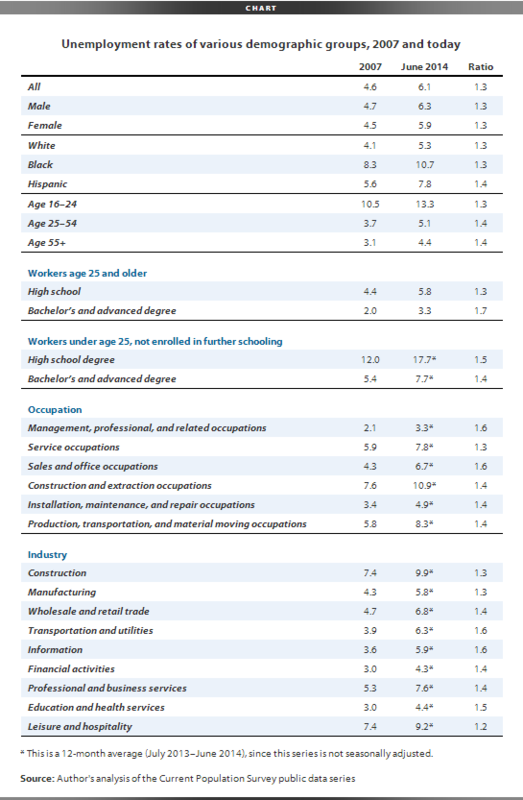 The figure below provides an age breakdown of the missing workforce. It shows that nearly three-quarters of missing workers are age 54 or younger, which means they are unlikely to be early retirees. Even if all of the missing workers age 55 and over will never reenter the labor force no matter how strong job opportunities get, that still leaves 4.4 million missing workers age 54 or younger who would be likely to re-enter the labor force when job opportunities strengthen. In other words, weak labor force participation rate remains a key component of total slack in the labor market. With the addition of 217,000 jobs in May, the U.S. labor market has now surpassed its pre-recession employment peak, a benchmark (the pre-recession employment peak) which is of zero economic interest. Given the growth in the potential labor force since December 2007, we should have added 7.0 million jobs since then, but instead we have added a net 113,000, so the labor market is still 6.9 million in the hole. 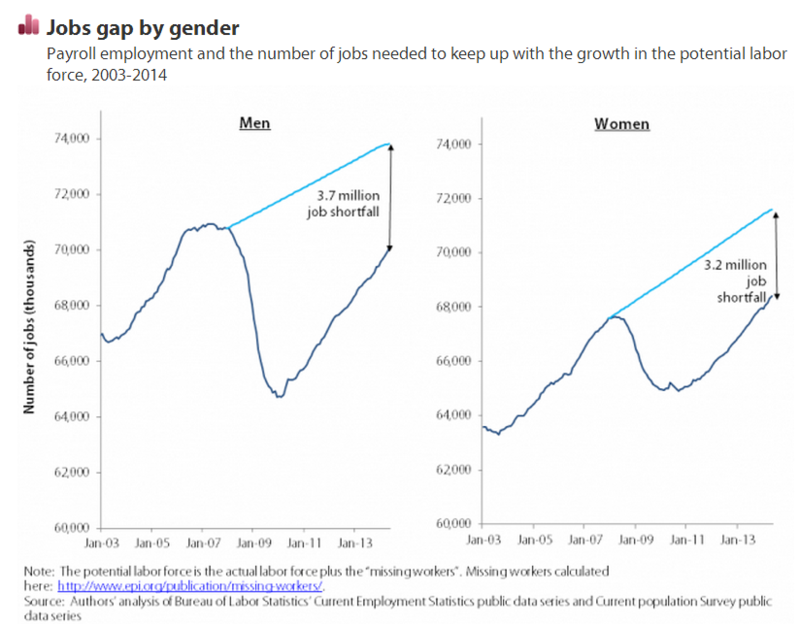 One interesting piece is the breakdown of that jobs gap by gender. As you can see in the chart below, women actually surpassed their pre-recession peak last August, but are still 3.2 million jobs in the hole given growth in the potential female labor force since December 2007. Men, on the other hand, are still nearly 700,000 jobs below their pre-recession employment peak, and given growth in the potential male labor force, are 3.7 million jobs down. The president has continually called for curtailing corporate incentives to outsource manufacturing to other countries, saying “it is time to stop rewarding businesses that ship jobs overseas, and start rewarding companies that create jobs right here in America.” A White House fact sheet summarizes his plans for restoring U.S. manufacturing jobs. Apparently, some folks in the administration haven’t gotten the message. On May 22, the Office of Management and Budget issued a notice for comments on a proposal to dramatically alter the way government keeps statistics on domestic industries. The proposal suggests “that factoryless goods producers (FGPs) be classified” as manufacturers. In honor of EPI’s new initiative, Raising America’s Pay, we updated our wage calculator, which shows how much you would be making if wages had kept pace with productivity. Having wages for the vast majority of American workers keep pace with productivity is a key indicator of an economy that is working for all. Economic inequality is a real and growing problem in America, but the discussion around addressing inequality too frequently sidesteps a crucial component: the key to shared prosperity is to foster wage growth for the vast majority of Americans who rely on their paychecks to make ends meet. In fact, raising the pay for most Americans is the central economic challenge of our time—essential to ameliorating income inequality, boosting living standards for the broad middle-class, reducing poverty, and sustaining economic growth. Crucially, the large and growing wedge between productivity and typical workers’ pay is not inevitable. For example, in the three decades following World War II, wages did rise with productivity and living standards improved throughout the income distribution. 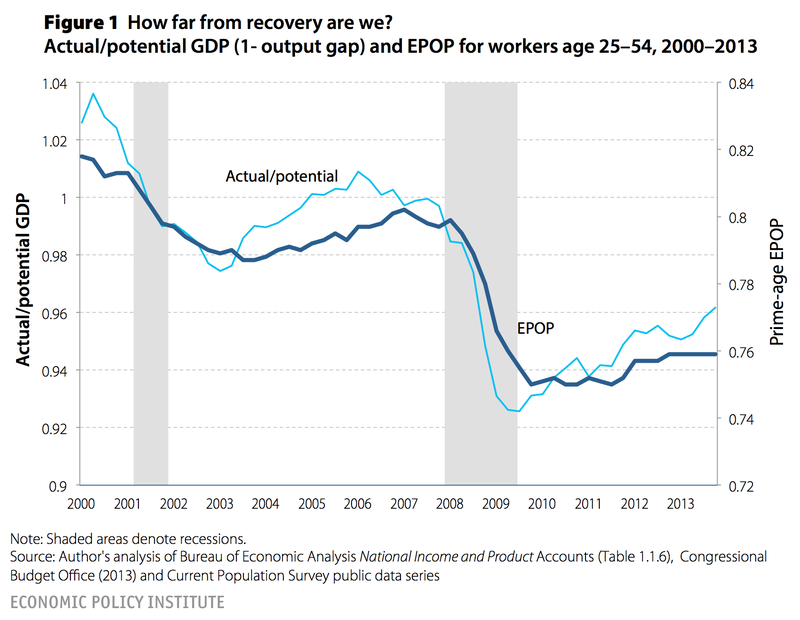 Since then, however, the rewards to a growing economy over the last three-and-a-half decades have primarily accrued to those at the top (except for the period of tight labor markets in the late 1990s). Since 1979, the workforce is more educated, is working more, and produces more goods and services in every hour worked. And yet the vast majority of workers are not reaping the rewards of their increased productivity. The Environmental Protection Agency is scheduled to release new regulations restricting the emissions of greenhouse gases (GHGs) from existing electrical generating units (EGUs, or power plants) next week. These new regulations will almost surely inspire a lot of debate over their effect on economic growth, and particularly on employment. It is important to note first that the overall desirability of these proposed changes is dominated by their impact in forestalling global climate change. In strict economic terms, this consideration dwarfs any plausible estimate of the rule’s impact on jobs. Yet joblessness and weak labor markets continue to loom large as chief concerns of Americans (as well they should), and debate on these grounds will surely continue. Given this, even though the employment impacts of the rule are small relative to the environmental impacts, they still should be examined correctly. This blog post details the various channels through which environmental regulations have the potential to affect employment levels in the U.S. economy. To begin with, the effect of regulations on the net level of overall employment in the U.S. economy is the result of the sum of larger gross employment gains and losses across industrial sectors. So, for example, even if analysis finds that the new regulations will result in small net employment gains nationwide, this does not mean that no jobs in the U.S. economy will be lost due to the rules. Instead, it simply means that the total sum of employment gains and losses across all sectors is positive. The Brookings Institution’s Mark Muro and Scott Andes recently published two blog posts which claim that the problems of U.S. manufacturing demand being depressed by large trade deficits—particularly trade deficits with China—are “a manufactured chimera,” and that the problems facing U.S. manufacturing are actually just evidence of insufficient domestic innovation. By deflecting attention from China’s manufacturing surplus, and the trade and currency policies China has used to dominate the market for manufacturing exports, Muro and Andes are distracting, not educating, those genuinely concerned with giving U.S. manufacturing a chance to compete in global markets. Claiming that it’s the domestic pace of innovation that is somehow the real cause of trouble is oddly provincial, and ignores some key global facts—like the fact that China has doubled down on its currency manipulation policies in the past year, and that its manufacturing trade surplus is projected to grow in the future unless something is done about it. The most fundamental problem facing U.S. manufacturing is a shortage of demand for U.S. manufactured products. Four years after the end of the Great Recession, real U.S. manufacturing output was 2.2 percent below its pre-recession level. Demand for U.S. manufactured products was much higher at this point in earlier business cycles: 11.1% higher in 2005 (after the end of the dot-com bubble), and 23.9 percent higher in 1995, four years after the 1990-1991 recession. In other words, our manufacturing problem today is, first and foremost, a macroeconomic problem. Without adequate demand, manufacturers will not invest in R&D, build new plants, or hire new workers. Demand for output from U.S. manufacturing can either come from domestic sources—American consumers, businesses and governments—or from foreign sources. Net foreign demand for U.S. manufacturing output is best measured simply as net exports (exports minus imports) of manufactured goods. The Federal Reserve, even after recent announced nominees take their jobs, will have two vacant slots on the seven-member Board of Governors. For a number of reasons, it even more vital than ever that these next two nominees be committed to using all the tools at their disposal (including the new ones provided by Dodd-Frank) to (1) generate genuine full employment in the American labor market and (2) rein in financial sector excesses that threaten economic growth and stability. Since roughly the end of 2008, a large majority of monetary policy observers have agreed that the Fed should focus entirely on boosting economic activity and employment, and not worry at all about inflationary pressures. This is not the normal state of the world. Normally, it’s thought that the Fed must walk a narrow path between providing support to economic activity and employment, but not generating such an excess of aggregate demand that the economy overheats and unleashes inflation. But the extreme economic weakness of the Great Recession crushed inflationary pressures and led to a cratering of economic activity and employment. Hence, it was correctly recognized that this delicate balancing act wasn’t necessary and that attention should instead be laser-focused simply on jumpstarting economic growth. Now, this large majority for aggressive action in boosting growth and employment looks to be fracturing, and worries about inflation and recommendations that the Fed stop its single-minded focus on generating a full recovery are surfacing. These are odd arguments to be making with the unemployment rate still matching the highest peak it ever reached in the 2001-03 recession and ensuing jobless recovery, especially considering that the headline unemployment rate has been driven down largely by the 6 million potential workers who are not actively searching for work but who would very likely join the labor force should job opportunities become less scarce. In essence, the arguments for a Fed “exit” from extraordinary efforts to boost recovery hinge on claims that very low rates of employment and very high rates of unused productive capacity relative to historic norms are not actually signs that the economy is operating below potential, because the resources idled by the Great Recession cannot be re-mobilized and should be just be considered gone forever from productive life. Importantly, however, this pessimistic argument has not been bolstered by any evidence showing that wages and prices are rising atypically fast. Indeed, the key measure of inflation tracked by the Fed has actually been pretty steadily decelerating in recent years—which is normally a sure sign that there is indeed lots of productive slack in the economy.